Deciding on how to choose a custom jeweler can be a challenge to say the least. Most people don’t have a vast knowledge of how custom jewelry is made and what qualities to look for in a custom jeweler. Luckily we are here to make that process a whole lot easier by simplifying everything into a list of things to look for and questions to ask your potential custom jeweler. Many jewelry stores make the claim that they offer custom service but for a lot of them this is stretching the truth a bit. Often the jewelers will offer the option of them assembling manufactured components to have a finished piece. While there is nothing inherently wrong with this procedure, it does not give you the flexibility a true custom jewelry project needs. A truce custom piece of jewelry needs to be built from the ground up. The two most common ways of achieving this are either casting or hand fabrication. This is the first question to ask your potential jeweler. Do they have the ability to cast and/or hand fabricate the piece of custom jewelry? Are they doing their own CAD work? If your piece is being cast then chances are the model will be produced by CAD software. It is incredibly important that the CAD work is being done by the custom jeweler in house. The reason I say this is that often there are many small changes that need to be made in the design process. If those changes have to be conveyed to an outsourced company you tend to lose details and the process does not go nearly as smooth as if you have the ability to discuss your project directly with the CAD designer. Are they a master stone setter? Stone setting is one if the most important aspects of a fine piece of jewelry. Almost all jewelers have the ability to prong set and bezel set a diamonds, but when choosing a custom jeweler you want much more than that. Your potential jeweler should be able to set diamond and color stones in almost every style that is available. This means being proficient in bead setting, cut-away styles, channel, pave, fishtail, shared prong, tab setting, and so on. Center stones and accent stones that are set properly make the difference between a piece that will perform well over the years and a piece that will have non stop problems. Make sure you choose a custom jeweler who is above the rest in stone setting ability. Can the custom jeweler hand engrave? Even if your your project does not require a hand engraver, it is a good metric to be aware of as many aspects of stone setting relate closely to hand engraving. 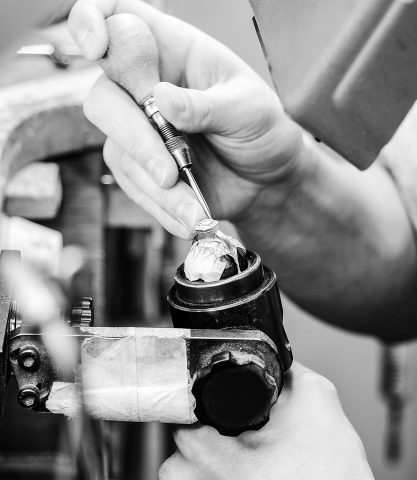 Over the years we have noticed that custom jewelers who are expert hand engravers are usually also master stone setters. The reason for this is that they use many of the same techniques and tools. 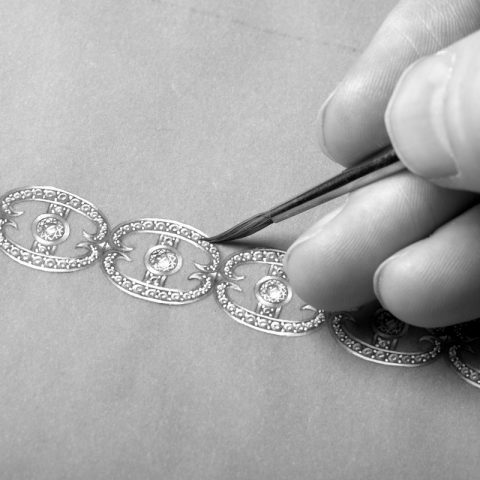 Take a look at the jewelers hand engraving work, you might decide that you want to incorporate it into your custom piece of jewelry. You should be able to see examples of the custom jewelry the store has previously done. Pictures and CAD renderings are nice but seeing live pieces in the case is much better. Ask to see the difference between cast and hand fabricated pieces. This way they can point out the differences in surface finish, symmetry, and design. Also play particular attention to the stone settings as I mentioned before. The stones should be uniformly set with enough material holding them in while not appearing too bulky. The same goes for their hand engraving work, it should be uniform, with nice bright cut lines. Make sure their engraving style matches your vision as all engravers have a slightly different style. If you are not able to see the differences with your naked eye then feel free to ask to look at the craftsmanship under a loupe for magnification. A good custom jeweler should be willing to explain the differences between all of these styles and fabrication techniques while showing you examples of each from their cases. The last part that may be the most important part is finding a custom jeweler that you feel understands your vision of what you want. Custom jewelry projects tend to change quite a bit in the design phase so you need to find a jeweler who is willing to move in one direction or the other when you need them to. Sometimes a customer comes in with one idea and then it changes dramatically after they are shown all of the options. If a custom jeweler can’t understand your macro vision they will not know what micro details to show you to make it as perfect as possible. 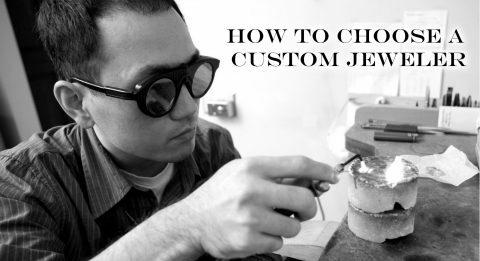 This is probably the most difficult aspect of choosing a custom jeweler. But it is probably best to boil it down to trust your gut with feeling of whether they will do a good job. Chances are if you have a good interaction with them and their goldsmith skills are up to par you will probably be thrilled with the custom ring or piece of jewelry they produce for you.